We have contracted with Bishop-Lyons Entertainment LLC to shoot a “sizzle” segment to promote a dog agility reality program. Bishop-Lyons will endeavor to sell the program concept in the mass media marketplace. The program focuses on the Top Dog team. The captains of the Top Dog team work with their club in the training and development of a competitive squad. A dozen or more dogs and their handlers will vie for a spot on the team. The captains of the team may, or may not, have dogs on the team in competition. On a weekly basis the featured team competes in the ongoing Top Dog league. And once monthly that team will go into the world to challenge the high scoring league team on their home field. The television program is uniquely tied to a broader social network. Clubs around the country, and around the world, can field league teams which compete on the same weekly courses as the Top Dog team and compete against them. And all of them will be eligible for a top spot on the program. We have identified a venue in Murietta California (near Temecula) for a Top Dog competition which will be used to shoot the sizzle segment. The competition will be three rounds in a team format. We’re hoping for a lot of local interest to come out and play. Likely we will have to limit entry. At this competition we’ll introduce the Top Dog team. At the same time, the course will be published as a challenge so that anyone in the world who wants to play these games and field a team in the Top Dog league can do so. All teams that compete on this premier weekend will become founding members of the world’s first semi-pro agility league. Top Dog Agility will create a fund from recording fees to pay out to top performing teams in the league. This idea has some real possibilities. Dog agility is played around the world. We’ll welcome everyone to join the league. At the same time, we will identify a robust curriculum of titles and meritorious awards for the earnest recreational player. This isn’t going to be about the top players in our sport only. Top Dog Agility will ultimately be the property of any network that buys the production of the reality show. Consequently I’ll be purging and allowing to go dormant existing blogs and Facebook accounts related to Top Dog Agility Players. These will likely get a new start, under the direction of our partners at Bishop-Lyons. I will publish information about the upcoming competition in Murietta California; how to register dogs and teams, and so forth, on this blog. Email me off-line if you need help getting started with us. I started a discussion a couple days ago on the Tandem Turn. I propose that dogs understand natural movement and a clever handler will use that movement to communicate direction and speed to the dog. The Tandem is a tricky bit in some ways. A dog is disposed to turn most naturally towards the handler. The Tandem, being a form of the Rear Cross does just the opposite. The handler is asking the dog to turn away. Some dogs don’t immediately “get it” and will towards the handler rather than away. Sometimes this is due to an error in the handler’s movement. More often it’s simply counter-intuitive to the dog. For a dog like this you should take exceptional training measures. You’re in luck if the dog is toy or ball motivated. The handler can shape the turn away by throwing the toy or ball at the corner of the turn. Practice this with the dog with a lot of repetition until the dog is taking the movement and arm as a cue to turn. To test the method, handler will approach the turn and pretend to throw the toy. When the dog makes the turn the handler will throw the toy as a reward. The handler has made a transition from “lure” to “reward,” a very important step in training the dog. Just because a dog understands the turn in one direction, that doesn’t mean he understands it in the opposite direction. Both directions should be taught to the dog. This is a poem attributed to a gentleman named Clement Clarke Moore an American Professor of Greek Literature and Biblical Studies. He was also a political writer and polemicist; and a dire critic of Thomas Jefferson mostly for Jefferson’s religious views. The poem which we know by the more popular title “The Night Before Christmas” was first published in the Troy, New York, Sentinel on December 23, 1823, with anonymous author credit. There’s a theory that Clement Clarke Moore plagiarized the poem, taking credit after the death of the real author, Major Henry Livingston. Livingston’s family claims he wrote the poem in 1808. Years ago, at the end of a seminar I taught, somebody asked me “What did you learn today?” The interesting thing for me then, and ever since, is that I had an immediate answer for her. It never fails that when I teach, I get to learn. 8 Kinds of Front Cross? The mechanics of each type of Front Cross is different. 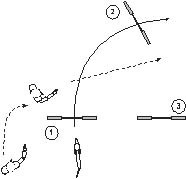 The basic attribute of a Front Cross could be stated: Counter rotation draws the dog to the handler. So the 8 different kinds of Front Crosses all (mostly) rely on the basic “drawing the dog”. Subtle differences in the mechanics deliver different strategic objectives without losing sight of the basic attribute. Each is like a choreographed dance. Posture, position and timing define each movement. Simple Front Cross – the handler changes sides to the dog in a Front Cross on the flat; this is an simple change of sides, unworried and unhurried. All other types of Front Cross are variations of the Simple Front Cross. 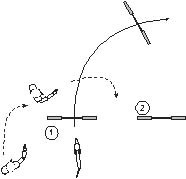 Layered Front Cross – The handler layers to the landing side of a jump then: 1) using counter rotation to create a corner of approach to the jump; or 2) using position to a turn the dog after the jump. Pre-cue Front Cross – The handler cues the dog to an impending turn by prematurely showing the counter-rotation of the Front Cross or by adopting a posture facing back to the dog. 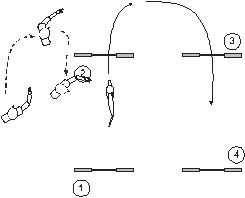 Serpentine Front Cross – The handler turns the Front Cross into a combination movement: either Post & Cross or Cross & Post. 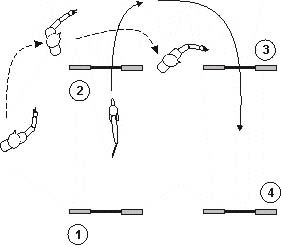 Technical Front Cross – The handler Front Crosses the dog on the dismount of a technical obstacle (contacts or weave poles). Blind Cross – This is a racing movement. The handler effects the change of sides by turning away from the dog rather than to. I sure managed to make all of those Front Cross notes above sound drop-dead boring. Well, I’m an old technical writer where drop-dead boring is a way of life. But to be kinder to the muse I’m not ashamed of a “Just the facts, ma’am!” attitude towards writing. The handler approaches a moment in the course where he’s got to change sides to his dog, and the change of sides must set the dog up square for the path ahead. But the handler doesn’t know where to set the corner, or even where the corner is, and begins the counter-rotation of the cross before he’s in the correct position and before it was time to turn the dog in any case. His run goes to hell! He cries, he spits, he blames the course! It’s a very emotional moment. Posted in Agility Instructor Training, Dog Agility Training, Handler Training | Comments Off on What Did You Learn Today? You are currently browsing the Bud Houston's Blog blog archives for December, 2014.